The United States Golf Association (USGA) and the World Golf Hall of Fame & Museum will exclusively showcase medals won by H. Chandler Egan at the 1904 Summer Olympics in St. Louis, the last time golf was part of the Olympic schedule. Golf will make its highly anticipated return to the Summer Olympic Games in August, in Rio de Janeiro, Brazil. Egan’s medals represent his achievements in the individual and team competitions at the 1904 Olympics. Egan, a Chicago native and a member of Exmoor Country Club, was captain of the Western Golf Association team that won the gold medal at Glen Echo Country Club in St. Louis. Additionally, he won the silver medal in the individual competition, finishing runner-up to George Lyon, of Canada. 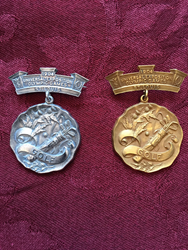 The medals, on loan from Egan’s grandson, Morris Everett Jr., will be featured at the USGA Museum as part of a special exhibit running from May 11 to June 8, and will also be at Oakmont (Pa.) Country Club during the 2016 U.S. Open Championship (June 13-19). As part of the display, the USGA will also showcase the runner-up trophy that Egan received for the individual competition, which is on loan from the LA84 Foundation. The medals will then be brought to the World Golf Hall of Fame & Museum in St. Augustine, Fla., where they will be featured in a new Olympics exhibit set to open June 23. Amy Alcott, 1999 World Golf Hall of Fame inductee and co-designer of the golf course in Rio, will be in attendance for the grand opening and unveiling of the medals. In addition to seeing the Olympic medals, fans visiting the exhibit can learn more about Egan’s extraordinary golf career, which included back-to-back U.S. Amateur Championship victories in 1904 and 1905, as well as four Western Amateur titles. Egan, who later designed nearly 20 golf courses, was a member of the USA’s Walker Cup-winning Team in 1934. The Olympic men’s competition in Rio is scheduled for Aug. 11-14, while the women’s competition is scheduled for Aug. 17-20, both at 72 holes of stroke play. The USGA conducts the U.S. Open, U.S. Women’s Open and U.S. Senior Open, as well as 10 national amateur championships, two state team championships and international matches, attracting players and fans from more than 160 countries. Together with The R&A, the USGA governs the game worldwide, jointly administering championships and international matches, attracting players and fans from the Rules of Golf, Rules of Amateur Status, equipment standards and World Amateur Golf Rankings. The USGA’s reach is global with a working jurisdiction in the United States, its territories and Mexico, serving more than 25 million golfers and actively engaging 150 golf associations. The World Golf Hall of Fame & Museum preserves and honors the history of golf and the legacies of those who have made it great. The Hall of Fame & Museum, located at World Golf Village in St. Augustine, Florida, serves as a steward of the game through engaging, interactive storytelling and exhibitions featuring artifacts, works of art, audio, video and photography significant to the history of golf and its members. The Hall of Fame is a 501(c)(3) nonprofit institution and is allied with 26 national and international golf organizations, including The European Tour, LPGA, the Masters Tournament, PGA of America, PGA TOUR, The R&A and USGA. To learn more about the Hall of Fame or to lend support, visit http://www.WorldGolfHallofFame.org. Its founding partner, Shell Oil Company, provides financial support and plays the lead role in charitable initiatives aimed at introducing golf to young people, and through the golf experience promotes scholastic achievement, community service and those values intrinsic to the game of golf: honesty, integrity and sportsmanship.